lean the chicken wings andpat dry with disposable kitchen towels. Cut each wing into two, separating the drummet from the wing. Place the chicken in a large bowl. Rinse the sand ginger and coriander roots to remove the attached dirt. Pound the ginger and coriander roots into fine paste using a mortar and pestle. Marinade the wings with the sand ginger-coriander paste, dark soya sauce, sea salt and coconut oil overnight in the refrigerator, covered with cling-wrap. Combine all ingredients for the dipping sauce in a bottle. Take the chicken wings out of the refrigerator and allow them to rise to room temperature before cooking. Drain any excess liquid from the wings. In a pan, heat up some coconut oil and pan-fry the wings batch by batch, making sure not to overcrowd the ppan. Drizzle in some dipping sauce as the wings are frying. 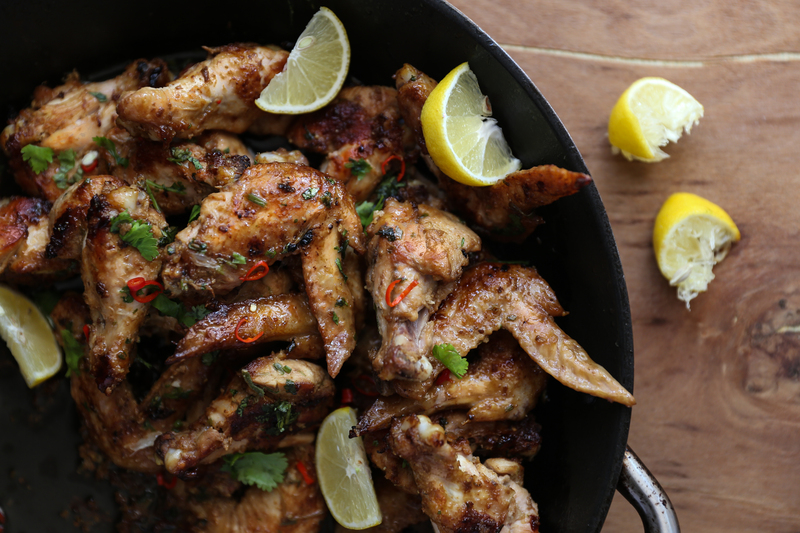 Remove the wings when cooked and serve hot with lemon wedges by the side.